The August/September issue of McCall’s Quick Quilts is now in stores with one of my quilts! This is my first pattern to appear in a magazine. I am super excited! They took such lovely pictures of it as you can see. They gave it a lovely name, Bed of Roses. I really love this quilt. It is a scrappy quilt made out of a nine patch block and an hourglass block. They complement each other so nicely. It is also really versatile. I made it out of fat quarters, but you could also make it out of a layer cake. The best part is that the squares for both blocks starts out the same size so you can start with any size square. Of course, some sizes are easier to divide into thirds for the nine patch than others. The layer cake for example is 10″ – not divisible by three, but you could cut 3″ of 3.25″ strips and have just a hair leftover with the nine patch block and you would just square up the hourglass block to the size of the nine patch and there you go! The border print is a gorgeous pink floral from Aviary. I put wool batting in it. Love wool batting! McCall’s has the pattern (throw size) is available online as a web extra too, so HERE’S THE LINK! Just an FYI about the pattern. I do make the hourglass a little different than they explain. The way I do it is explained in THIS TUTORIAL that has a horrid picture of the quilt on it that I haven’t gotten around to changing. Woo-hoo! It’s beautiful. I loved your display at the show in SLC in May! Lots of great things happening for you. How many Fats did it take? Congratulations – that is wonderful! Konda, Congratulations on being published in your first magazine. The quilt is lovely, very tempting. Ha, ha! Couldn’t remember how many fat quarters. Had to go look. I used 30 fat quarters for the queen size. Congratulations! 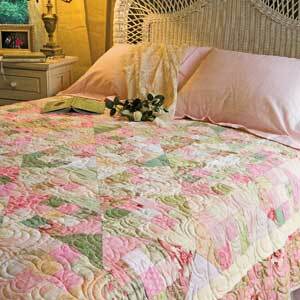 I love those yummy colors in your Bed of Roses quilt! oooh, thanks, i have just the perfect fabrics for this! It is gorgeous! I saw this and it is lovely, gorgeous. Congratulations! Looking forward to seeing many more. Congratulations!!! How exciting! That’s a beautiful quilt. Congrats! That is a very beautiful quilt. How excited you must be! The quilt is beautiful. We are proud of you. Congrats! Beautiful quilt…I downloaded the pattern, hope to make it sometime next year, love it that much! Also forwarded the link to my daughter in N.C. She loved it too. Keep up the good work!!! Huge congratulations! Your quilt is beautiful and deserves to be on the magazine cover. I once submitted a photo and my quilt pattern to the magazine and received a nice rejection letter. So, to me, this is a really big deal. Also, I love your current Jelly Roll quilt-along. Congratulations on being published…how exciting that must be!! Gorgeous quilt and in my favorite colors too!